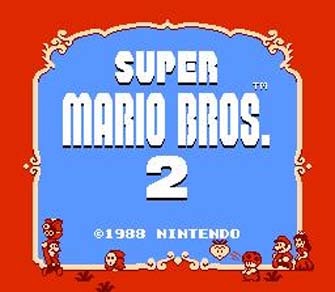 Today, Super Mario Bros. 2 is often seen as a “black sheep” in the Mario series, neither as revolutionary as its predecessor nor as excellent as its successor. But truth be told, if Super Mario Bros. 2 is a lesser entry in the Mario canon, then let that speak to the overall quality of the series. Super Mario Bros. 2 is still a great game. It’s true, the game we know as Super Mario Bros. 2 is just the Japan-only Nintendo title Doki Doki Panic retooled with Mario characters in it. But that shouldn’t take away from the fact that the game was among the best platformers of its era, not to mention the impact it had on the Mario universe. 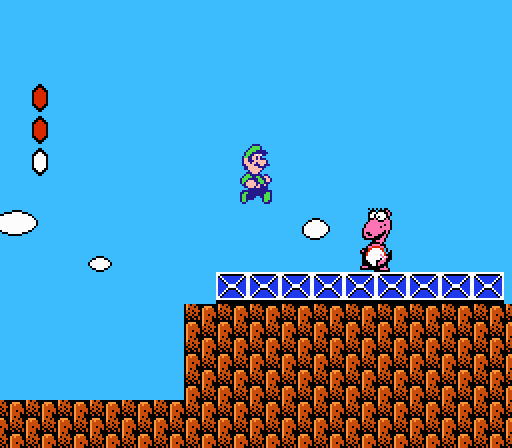 Birdos, Bob-ombs, Shy Guys, many elements that are common place in Mario games today got their start here. This even includes the attributes of the main characters. Players have the option of selecting four characters: Mario is well-rounded, Luigi has the highest jumping and descends slower, Peach can temporarily float in the air, and Toad lifts objects the fastest and throws them farthest. The gameplay is unique among Mario games in that jumping on enemies doesn’t defeat them. Instead, you can jump on an enemy’s head and lift them up, and then toss them at other enemies. Additionally, vegetables are abundant in the ground, and can similarly be plucked and tossed at foes. It’s a fun gameplay hook that still stands out in the Mario series. One downside is that the usual Mario power-ups are nowhere to be found (aside from an occasional Starman). Instead, players gain extra health by finding mushrooms in warp zones (temporary bonus rooms accessed through hidden doors). It’s just a shame the added bonuses found in warp zones don’t continue through subsequent levels, as it could have added an interesting RPG element to the Mario formula. But it works for the game at hand. Mario and company will of course venture to various themed worlds, each with a handful of stages and ending with memorable boss fights (boss fights which, I must admit, are more varied than those in the more popular Super Mario Bros. 3). It’s not as expansive as Mario’s later ventures, but it provides the same sense of fun. The graphics are colorful 8-bit sprites, but not as detailed as those found in Mario 3. The music is a highlight, featuring some iconic pieces from the NES era that are still remembered and remixed today. Super Mario Bros. 2 has a whole lot going for it, and it has aged more elegantly than the brunt of NES titles. Yes, it’s shaky origins mean it deviates from many loved elements of the Mario series (no Fire Flowers), and some might even say it feels slower when compared to other entries in the series, but Super Mario Bros. 2 is still a blast to play. Whether you’re firing up the old NES or playing it through the Wii U Virtual Console, Super Mario Bros. 2 proves that being a black sheep doesn’t have to be a bad thing. The game has indeed aged very well. Like a fine wine. Or so they say. It may be the black sheep of the Mario series, but it’s still darn good.